1 Theatre. An Evening Of Eric & Ern At Christmas, Chichester Festival Theatre, December 2, 7pm. Join Olivier-nominated Jonty Stephens and Ian Ashpitel in a tribute to Britain’s best-loved comedy duo, crammed full of those famous Morecambe and Wise routines, sketches, songs and a musical guest. 2 Music. Chichester Chorale offers its Christmas concert on Saturday, December 8 at 7.30pm at St George’s Whyke, Cleveland Road, promising Bach’s Wachet Auf and a selection of favourite Christmas songs and carols. Tickets on pollyrobson2003@yahoo.co.uk. 3 Theatre. The Nightingales, a comedy by William Gaminara, directed by Christopher Luscombe, Chichester Festival Theatre, November 27-December 1, starring Ruth Jones. Under the watchful eye of Steven, their choirmaster, Connie, Ben, Diane and Bruno gather every week in the village hall to practise their accomplished acapella singing. They are a motley crew, but whatever their differences, whatever the problems they may have at home, all are happily bound together in their shared love of music. Until one day Maggie knocks on the door. 4 Music. Christmas will once again come at the double for the Leconfield Singers who will be offering two concerts in one day on Saturday, December 8 at St Mary’s Church, Petworth. The matinee concert at 2pm will see them joined once again by the Dorset House School Choir. The evening concert at 6.30pm will feature A Winter’s Night by Cecilia McDowall.leconfieldsingers.co.uk. 5 Music. The Magnard Ensemble are the December guests in the Chichester Chamber Concerts series. Tickets for their recital in The Assembly Room in the Chichester Council House in North Street are available from the CFT. They perform on Thursday, December 6. 6 Music. Christmas Concerts, Chichester Festival Theatre, December 4-8, with The Band of Her Majesty’s Royal Marines Portsmouth and Chichester Cathedral Choir. Celebrate the festive season with traditional carols, seasonal sing-alongs and a Christmas cracker joke or two. The CFT welcomes back the Cathedral Choir directed by Charles Harrison, and The Band of Her Majesty’s Royal Marines. 7 Festival. A special seasonal treat of words, music and mince pies is heading Chichester’s way when the Festive Jazz Café takes off in the atmospheric setting of historic St John’s Chapel on Thursday, December 6. 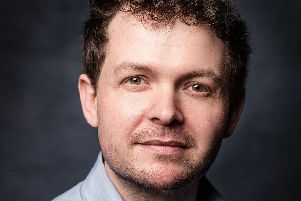 The event is in aid of next year’s Festival of Chichester, and organisers are promising a scintillating cast of performers offering a package of seasonal delights. Gareth Williams is among the performers. Festive Jazz Café, Thursday, December 6, 7.30pm, St John’s Chapel, St John’s Street, Chichester. Tickets £12 (students £10) from Novium/TIC, Tower Street, Chichester. 01243 816525; thenovium.org/boxoffice. 8 Theatre. Nicci Pennicott is directing A Bunch of Amateurs for the Midhurst Players. Nicci’s production of Ian Hislop and Nick Newman’s play runs from Wednesday, November 28 to Saturday, December 1 at The South Downs Centre Memorial Hall. 9 Music. Chichester Jazz Club welcome Jo Fooks (left) and her Quartet to The Pallant Suite, Freemason’s Hall, 7 South Pallant, Chichester on Friday, November 30. They comprise Jo on tenor saxophone, Ted Beament on piano, Steve Thompson on bass and Bobby Worth on drums. Tickets on 01243 775888. Doors open 6.45pm, music starts at 7.45pm. 10 Art. Artist Andy Waite is offering a Christmas exhibition in Arundel, taking place over five days including two weekends. The exhibition will be on Saturday, December 1 and Sunday, December 2 from 11am-5pm; Friday, December 7 and Saturday, December 8, 11am-8pm; and Sunday, December 9, 11am-5pm at 54 Tarrant Street, Arundel.